Inbound Marketing Problems: "Editing Our Content Takes Way Too Much Time"
It was 9 p.m. Everyone else had gone home, and I was sitting at my desk in an empty office. At the time, I was Quintain's content manager. In my role, I worked closely with our account managers and our clients, as I managed all of the interviewing of subject matter experts, as well as the editing and publication of all content for our clients. I also managed our network of freelance writers, and acted as their managing editor to ensure the scope of each piece matched the strategy I had outlined for them. For each piece, a writer typically received an audio recording of my subject matter expert interview (about 15 to 30 minutes in length, depending on the depth of the topic), a content style guide I had built for the client, an overview of the purpose and persona for each piece, as well as any other notes or outlines I felt they would require to complete the assignment. As a word nerd, I loved my job... for the most part. But that night, I hated it. My husband was always understanding about late nights, but I had left him hungry -- "You only have ingredients in the refrigerator; what am I supposed to do with lettuce?" On top of that, I had 16 different articles I had to work through -- a blend of assignments that had come back from writers, and a client who had finally worked through their own bottleneck of edits. Given that it took me about 30 minutes to an hour to work through each piece, at the time, I sat there with my head in my hands. I had no idea what I was going to do. At that pace, I could have stayed at work another six hours -- leaving Patrick to starve and my sanity to wither -- and still only gotten through maybe 50 to 75% of my backlog. I had a reputation of being a great writer and editor at Quintain, but it was the volume that was killing me. Not because it was unfair, but rather it exposed a huge weakness of mine. A weakness I'm sure a few of you might also be suffering from. The quality of my work was outstanding, but that didn't change the fact that my editing process was utterly broken and not scalable. And the situation I was in, at that moment, could have been avoided. First, I did not push back on my writers nearly enough. Second, I was trying to edit for everything at once. Which is impossible. "We can't ramp up content production because editing takes too much time." "The quality of work I'm getting back from my writers isn't getting better." "I just want to scream at my bosses who want me to be more efficient, 'You have no idea how bad the quality of work is that I'm dealing with,' but they don't want to hear it." "I feel like I am never, ever going to get ahead on our content calendar. I'm living in an endless loop of always feeling behind." "I can never get to the point of being more strategic in my edits, because I just need to get stuff done and up. I'm always in catch-up mode." If any of these sound familiar, you're probably dealing with at least one of the problems I mentioned above. Today, I'm going to explain why each of those problems exist and how to solve for them. First, however, I want to make something clear to anyone reading this who feels seen, but also feels like a failure. You're not a failure for not having identified these as problems and for suffering in editing purgatory. One of the things I've talked about in the past is that the demand for high-quality content has risen, because the inbound marketing space is crowded. So, while it used to be that marketers could pull double-duty as marketers and strategists who moonlight as content strategists and editors, that doesn't quite work anymore. The skills I'm going to teach you are often not native to the inbound marketing world, unless you've already started hiring people who have some sort of background in professional publishing, journalism, or some other written communication-based field. But you can learn those skills. Going back to that night in 2015, my biggest problem was that I had seven pieces that had come back from writers. Back then, if I received a piece of writing back from a freelancer that wasn't good, guess what my first inclination was? I would open up the document and get to work editing as best I could. My goal was to have a finished, client-ready piece by the time I got to the end. Even if it was bad, that just meant I had that much more work to do. Which is exactly the opposite of what I should have been doing. Take five minutes to review a first draft from a writer or returned edits on a draft from a client, where revisions have been requested. Skim, do not edit, at this phase. Deciding to keep or send back content to a writer is often a judgment call that strikes a balance between not driving up costs with unnecessary revision cycles with a paid writer and making the best use of your own time. The best practices below can help guide you. The writer did not follow the instructions in the work order, and thus did not meet your expectations. The focus of the article is correct, but the overall quality is subpar or lacks the polish that is to our standards. The client has requested revisions that require a restructuring or reworking of significant portions of a blog post that would take more than 10 to 15 minutes worth of work. The writer has done a good job delivering against the work order, and the piece only requires minimal spell checks and tweaks that would take less than 10 to 15 minutes to complete. The client has provided minimal edits or comments that can easily be implemented or resolved in less than 10 to 15 minutes. The first thing I do is skim; I do not edit. I do not need to deeply edit an article to figure out if we're in the ballpark of what I was looking for. A quick five-minute review will tell me whether or not the quality is where it should be and the strategic scope of an article is in-line with what was asked for. If it's not, back to the writer it goes. A writer's failure to meet the requirements of an assignment is not my problem. I cannot stress how important it is to not allow your writers -- whether they're freelancers or colleagues who contribute -- to get the "gold star" of completing an assignment if you basically have to do the work yourself to make it useable. By following these two rules, I drastically reduce the amount of time I spend on fixing terrible work. Moreover, I do not become a doormat for writers who learn over time -- because I enable them by not holding them accountable -- that I will just fix their bad work for them. Think about it -- under the "I'll just do it myself" process, there's no incentive for someone to deliver the quality I'm looking for. What's the point, when I'll just do it for them, right? But I was also hurting myself, too. By always positioning myself as a reactive editor, I never give myself a chance to develop myself professionally as a content manager or editor who has a voice or a vision. I also never give the writers who genuinely want feedback -- and the ability to learn and improve -- a chance to do so, because I'm just doing it for them. The best part about this strategy is that, in the cases where the writer failed to meet expectations or needed to do more work, the edits I returned were more global and fewer in number. 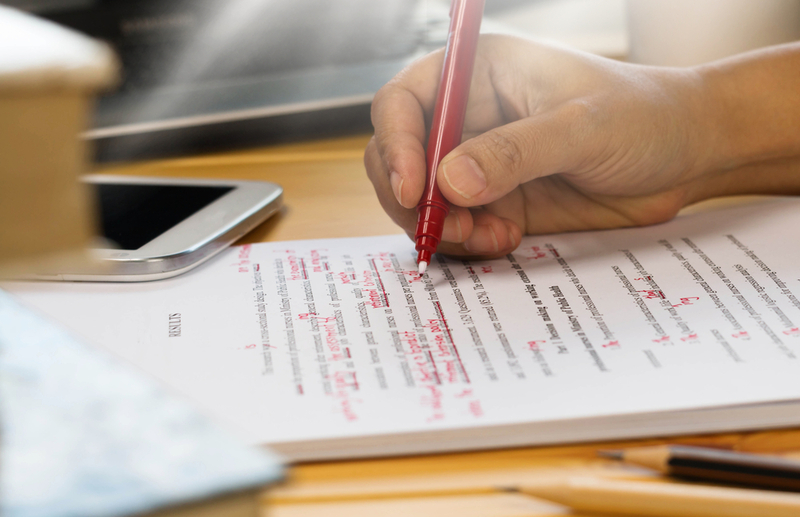 Instead of a document with lots of markup, I'd just highlight sections or provide more 80,000-foot view feedback with a note that, once those issues are resolved, we can move into more copy-editing. I'm going to be upfront and say that you are going to think I'm crazy as I explain the solution to this problem. You're going to think I'm telling you to do more work, which will take more time. ...even though there are seemingly more steps involved. Someone gives us a document. How's the spelling, grammar, and syntax? Did they nail the narrative structure -- should anything be moved around? Have they answered all of the questions or covered the topic deeply enough? Is the voice and tone -- the "style" -- in-line with brand standards? How's the visual formatting with bullets, headings, and subheadings? Considering how important each of those five points are to ensuring a piece of content meets the needs of the audience, while also reflecting positively on the brand that's doing the publishing, this list makes sense, right? But the idea that you can effectively evaluate a piece of writing for each of those items at once is not only asinine, it's incredibly inefficient. Let's say you have an 800-word blog article you're editing from an internal subject matter expert. You do all of the copyediting against those five points above, including making a bunch of spelling and grammar edits. "I'm not sure this answers the question we're looking for -- can you take another run at this?" They come back later and the section is rewritten entirely. If you've made any edits to that section, you can kiss that work goodbye. Now you have a whole new section -- potentially longer than the first -- that needs to be reviewed, from scratch. The moral of the story here is you need to solve for the big problems in a piece of content first, before you even bother with the window-dressing edits. You need to edit for each of those five standards, but in phases. Never all at once. Otherwise, you'll end up having to redo your work because (a) depending on some of the edits you provide a writer, you may end up in the scenario I outlined above; and (b) it's almost impossible to effectively edit for everything all at once. You may think you can, but it's likely that you'll find yourself reading and re-reading something over and over again to make sure you got everything. First, edit for structure and scope. If there is anything that comes up here, ask the writer to resolve those comments before you move onto the next phase, so you don't have to redo your copyediting. Next, edit for visual presentation and then content style. Once you're sure the ideas are sound and presented in the right order, you can get to work on massaging how the content looks -- maybe a paragraph might do better as a list or you need a few more subheadings -- and then clean up the style of the content. Finally, edit for spelling and grammar. Even though these edits are the easiest to spot, you're wasting your time editing for this upfront. If there are a lot of them, you should have already instructed the writer to proofread their work again following the skim test. By leaving this step to the end, you're only doing cleanup on a piece of content you know is in-line with the quality and depth of what you were looking for. It sounds simple enough, but it makes a huge difference. "These Solutions Sound Great, Liz, but That's Going to Require a Lot of Change for My Team"
If it makes you feel any better, this is exactly how I used to feel. After that night, once I realized why I was struggling with the workload of copyediting at scale, I made every excuse in the book as to why I couldn't make the changes I knew I needed to make. It'll make our production timeline longer. I can't go back and ask clients or writers for more work. We're not far enough ahead. Finally, once I was done complaining, I realized the "pain" of restructuring how I do my work and communicating that to my team, freelancers, and writers would be far less than the very real pain I was feeling from always being behind. In fact, it would make that pain go away. And, in a lot of ways, it did. The changes I was going to be making and the why for each, so they could see why each of those changes were important and not arbitrary. The outcomes I expected to see as a result of these changes, which included our ability to get ahead, to empower others to be the content contributors they needed to be, and, ultimately, to increase the quality of content we were producing -- which help us reach our goals faster. While I was scared about the communication strategy for it, that ended up being the easy part. The hardest part for me will probably end up being the biggest challenge for all of you who need to transform your content production and editorial processes. You have to stick to your guns. You have to get better at delivering feedback and not wasting your time fixing the substandard work of others -- otherwise, you'll be paying your freelancers money they didn't really earn and/or your internal contributors will rely on you to do your work for them. But you also have to push back on those who seek to create efficiency in these processes in a way that will erode the quality of what you're producing. "This step is non-negotiable and cannot be streamlined. This is where the story comes together, so, if we skip this or 'try to go faster' here, we're going to compromise the final product. However, we can talk about other parts of the process that won't impact the substance of our content." If your process is a jumble of moving parts, where you can't point to a single step and MC Hammer it by saying, "You can't touch this," you'll never win a process argument. You'll never be able to justify with any authority that you have a process to begin with or steps within it that are worth preserving. You'll Come Out the Other Side, I Promise! Of course, you're still a finite resource. You can make your processes more scalable. But there will always be a breaking point where you'll need help in this department, depending on how robust your organizational vision around content production is. That said, as someone who has been through this pain before -- complete with crying and nights where I questioned if I was good enough at my job -- and solved for it, trust me when I say you've totally got this. This pain can be temporary, but you have to commit yourself to being the owner of your content and making the changes you need to, so you can get ahead and produce better inbound content. Not only will you solve for the pain, you'll also create more time for high-value activities that can establish you as a content visionary within your organization.